This diagram shows the two phases of the hindleg action (illustrated here in walk where it is most clear) and how the rider's seat interacts with these phases of movement. The first phase (left-hand diagrams) is when the hindleg reaches under the horse's body and lands, and the other phase (right-hand diagrams) is when the hindleg pushes back and stretches out behind the horse's body. In the horse's natural way of moving, this push back is accompanied by a tilting forward of the pelvis (un-tucking), with a dropping (hollowing) of the spine, and a raising of the head. When the hindleg steps under the horse (first phase) the pelvis is brought into a tucked orientation, and the back is lifted. At this moment, the horse's head will tend to drop. The top two diagrams show the interaction of the seat with these two stages when the rider is starting from the basis of an 'upright seat', where there is little core engagement. When the hindleg pushes out behind, and the horse's pelvis disengages, this seat provides no resistance, and is drawn into the 'fork seat' position by the powerful forces of the horse's movement. In this seat dynamic, both horse and rider's backs become hollow during this phase, and the horse will 'come against the bit'. There is little transmission of the energy generated by the hindleg though the horse's body to maintain a longitudinal, postural stretch towards the bit - it is all used up in locomotion. Because the horse's pelvis has 'un-tucked' in the push-back phase of the stride, it is then compromised in its ability to subsequently reach forwards under the horse's body in the following phase. The result is hindlegs which work out-behind the horse, and cannot generate power and collection. In the bottom two diagrams, the rider is coming from the basic dynamic of the tucked pelvis. In this position, when the hindleg reaches under, the seat - with a stretching of the lumbar back and lifting of the pubic arch - follows into the accompanying tuck of the horse's pelvis, consolidating it, and allowing the horse to step further underneath his body. When the hindleg then stretches out, the rider's abdominal muscles engage to RESIST the un-tucking of the seat, and this has the effect of resisting the horse's own disengagement of the pelvis. Both horse's and rider's backs are prevented from hollowing, and the horse is therefore able to maintain longitudinal stretching, and keep softening into the contact. 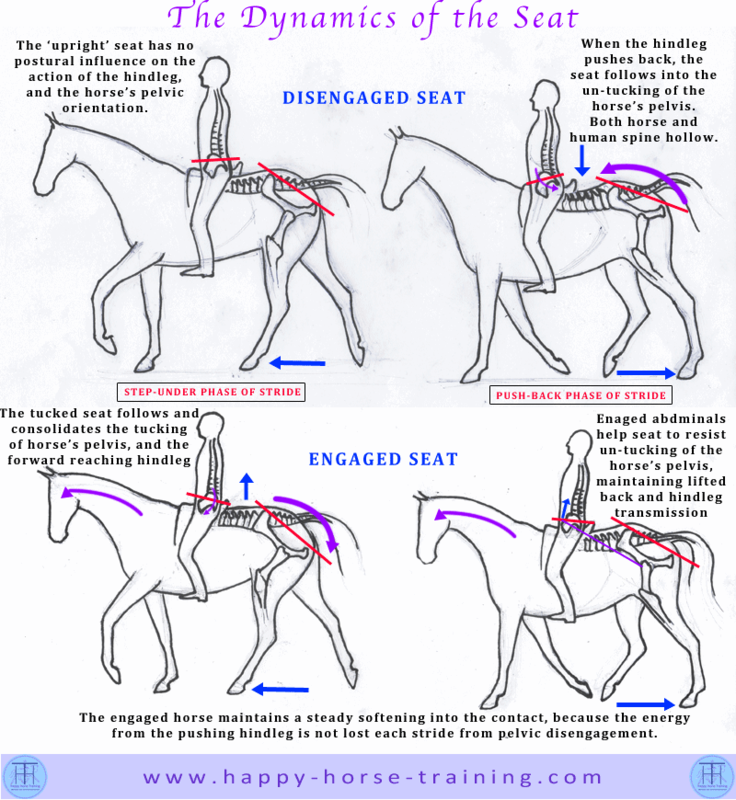 Clearly, with the engaged seat there is still a change in orientation in both horse and human pelvises between the two phases of the stride, but even the relatively small postural influence of the engaged seat on the horse - resulting in a slight change in the horse's pelvic orientation - has the power to profoundly alter the horse's balance and overall biomechanics, and to generate a significant amount of channeled power. The postural influence of the engaged rider, therefore, is not by any means a rigid, unyielding influence - it is a dynamic interaction with the horse's movement, but what it PROMOTES is consistency in the horse's ability to lift the back and maintain transmission of power from haunches through to contact.